This is a photograph of a recent custom order. This custom order was made with hand-fabricated sterling silver and incorporates four amethyst cabochons and a 1/4 carat diamond. The other is a piece that was inlaid with gaspeite and opal stones. 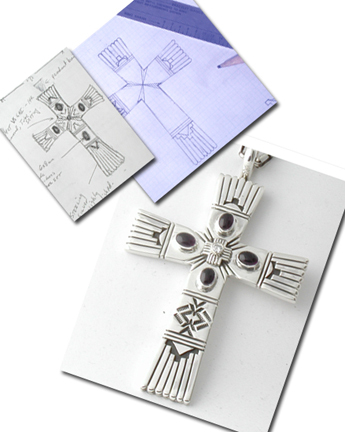 At Begay Indian Jewelry, I do welcome custom orders. If your are in the Las Vegas area or visiting Las Vegas, please stop by and we can discuss your ideas. Or if you cannot make it to the store, I can work over the Internet, via email. I work with only silver and gold and quality stones.Typically, I can do anything. I have made custom orders from tattoos to polar bear teeth. I work with diamonds, emeralds, rubies, sapphires, tanzanite and other precious gemstone. I also work with turquoise, coral, sugilite and other semi-precious stone to create custom order jewelry. 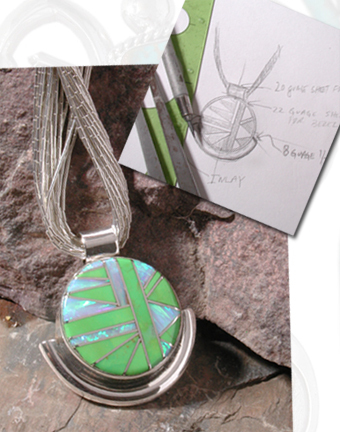 I work with your idea and concepts to create a truly one-of a-kind-piece. I can work with your stones or mine (restrictions apply). If you are searching for a jeweler to take your ideas and turn them into reality, look no further. The custom order that I do will typically reflect southwestern influences, please take some time and look through my products, as they will give you an idea of what I do. First, the design concept is discussed with the client. Usually, I get a feel for the" look" you are trying to achieve. Then I will produce a semi-detailed drawing/sketch to convey what I can do. Also, stones will be discussed as to what sizes, color etc is required. At this time, I will seek your approval to move to the next step. Second, upon your approval of the drawing and price, I need a 50% down payment for me to get started, with the balance due upon completion. Third step, after your approval and payment it then I can actually start making the piece. This encompass drawing precise designs( as seen in the photo below), cutting stones, producing master models for castings, soldering, rolling etc. In other words, now the project is entirely in my hands (literally),until it is complete. Fourth step: Completion. Upon completing your piece, I will email you a detailed photo(s) or the work. It is then I need final payment to ship. We require a non-refundable down payment of 50% of the total amount, and the balance paid upon completion. Upon completion, I will photograph the finished piece and email it to you. Then the balance is due, and the piece is shipped. Now, what if I don't like it when it is done? I do my best to accomplish one goal: to have your complete 100% satisfaction. If I fail at this, then there are several ways accomplish my goal. The main thing is, at the time of ordering I will inform you whether the piece is refundable or not.This becomes tricky when I am working with client's stones, as I would have to remove them. Or, if a piece has initials, name or symbols that make a piece to unique to sell, then such pieces would be non-refundable. All custom pieces are guaranteed under my repair policy. 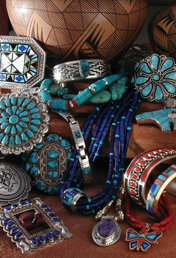 Indian Jewelry is not responsible for any lost, stolen or damaged items that belong to the customer. All material left in our care is left at the risk of the customer. ANY ITEM ON THIS PAGE IS A CURRENT CUSTOM ORDER. THESE PIECES ARE NOT FOR SALE, UNLESS YOU HAVE BEEN DIRECTED HERE.